I loved grilled cheese sandwiches as a kid, and I still love them, so I decided to feature them on the menu at Cockscomb right from the start. But this isn’t Grandma’s grilled cheese sandwich, this is a decadent version with all the trimmings to make it an indulgence. Creamy Taleggio cheese melts perfectly and has just enough of that funky cheese flavor to make it wonderfully interesting. Italian Taleggio takes its name from the valley of Taleggio. It’s a semi-soft, saltwater washed-rind cheese that smells stronger than it tastes and dates back to Roman times. 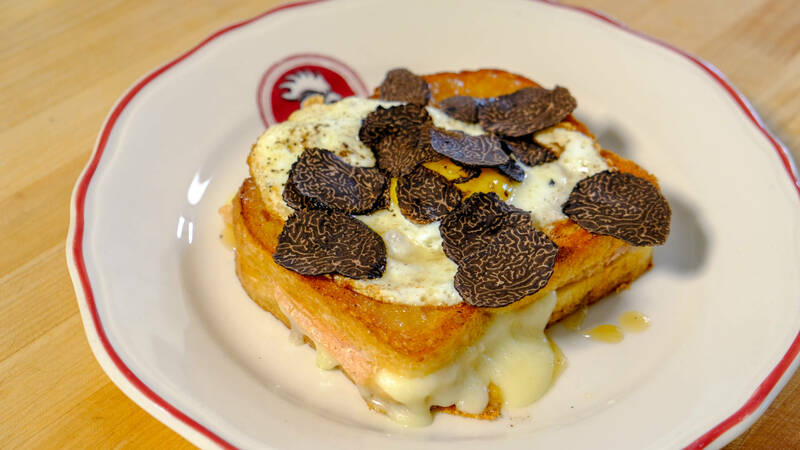 For me, gilding the sandwich with a fried duck egg and topping it with freshly shaved truffles makes for perfection! Slice the cheese and gently flatten it so that it fits the surface of one slice of bread. Top with the second slice of bread. Heat a nonstick pan over medium heat, add half of the butter and when melted, add the sandwich. Cook until golden brown then turn and cook the other side. In a separate pan, melt the remaining butter; gently break the egg into the pan and cook until the white is set and the yolk is still runny. Using a spatula, set the egg on the cooked sandwich and place on a warm plate. Season the yolk with salt and drizzle the honey over the egg and sandwich. Shave truffle slices over the top to garnish, if available. Serve immediately.